Our Seniors were Runners -Up again in the South West 3 day event. It was Gloucestershire's turn to host the event this year and the Cherington course at Minchinhampton was in excellent condition for the 3 days of matches. Karen Rix has taken the trouble to report on each day's matches which we have published on the Seniors section of the website. You can access the Seniors' page via the Teams tab. 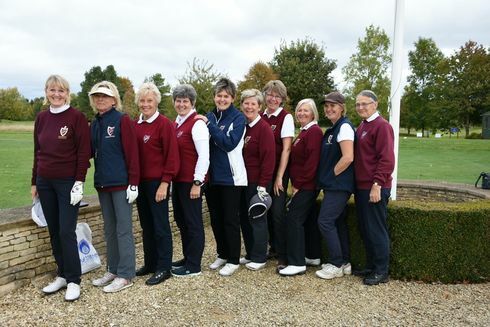 Pictured from left right are Jan Pickersgill, Caroline Shepherd, Ann Manley, Corrinne Durber, President Sue Rawles, Karen Rix (Captain) Paula Crabtree, Frances Lindley, Alison Kelly, Pam Tozer. Dawn Rimmer and Louise Church were also part of the team but unfortunately not present on the day of the photograph.